Felton Thomas Jr. of the Public Library Association and PCPL Interim Director Amber Mathewson at the launch of the new partnership. 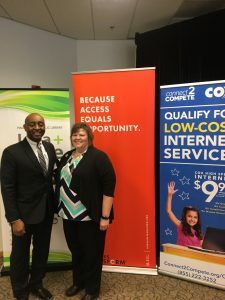 (TUCSON, Ariz.) – Since launching Connect2Compete in 2012, Cox Communications has connected more than 260,000 low-income people, many of whom would otherwise lack access, to the internet and the technology to be successful in today’s digital world. A new partnership between Cox and the American Library Association builds upon that commitment to connect people with technology and provides an even stronger foundation for success in the classroom, in continuing education, and in job opportunities. Pima County Public Library is one of three libraries nationwide – joining Topeka, Kansas and East Baton Rouge, Louisiana – that has been selected to offer enhanced digital literacy training and resources in person and online www.digitallearn.org.